The General Election Commission of Teluk Wondama Regency, West Papua, began sorting boxes and voting booths for the 2019 General Election. 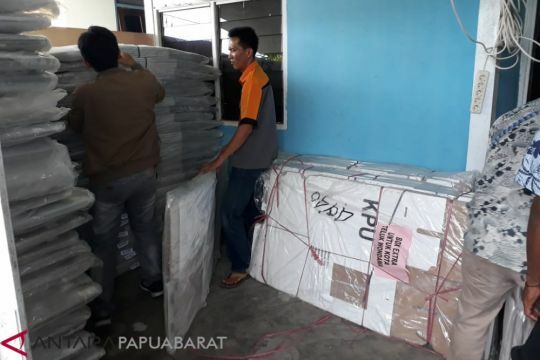 “Sorting to ensure the number of boxes and voting booths sent by the central KPU at the same time confirms the condition,” Gulf Wondama KPU Chairman Monika Elsy Sanoi said in Wasior on Tuesday. The sorting was witnessed by the Chairperson of the Election Supervisory Body, Menahen Sabarofek, and the Wondama Bay Police Chief, AKBP Murwoto. He said, all items were still in a new condition. If there is a shortage, he will deliver to the Indonesian KPU to be sent immediately. From this sorting, there are known 798 ballot boxes and all are in good condition and are suitable for use. Similarly, 524 voting booths were sent together. After receiving the boxes and voting booths, another logistics is still awaited at this time, which is the ballot that is currently on the way from Java to West Papua. The Chief of Police Murwoto on the occasion advised that the Wondama Gulf Election Commission should ensure the security of election logistics. All bad possibilities must be anticipated so as not to trigger problems that can delay the election. “Such as fires caused by various factors including electrical short circuit. Insecurity also needs to be anticipated when logistics distribution such as bad weather,” Murwoto said. Murwoto said that the Teluk Wondama Regional police station had secured the election in the area. This Democratic Party is of particular concern to the National Police Chief. “Police in each region must ensure that the Election Implementation in their respective regions runs smoothly. We have also prepared a plan for election security activities,” said the Chief of Police.